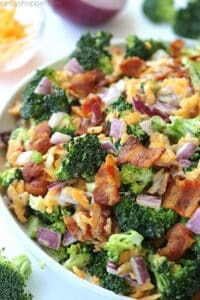 You will find this Creamy Broccoli Salad loaded with bacon, red onion, cheese, and a delicious dressing. It’s a perfect side dish for any meal and also great for summer potlucks and bbqs. I love to share all the easy salads that I make for my family with all of you here on my blog. This past couple of weeks I have been anxious for spring and summer so, I have been making lots of great summer salads. 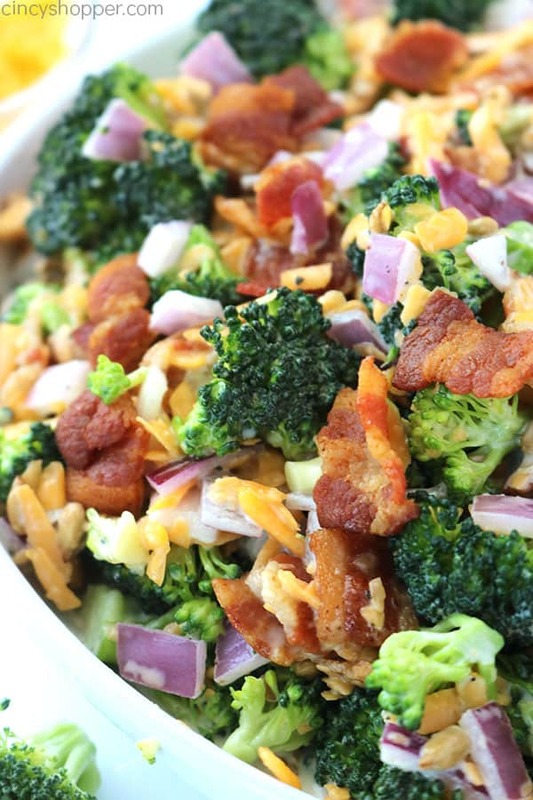 Consider making my Broccoli Salad for your next summer potluck. 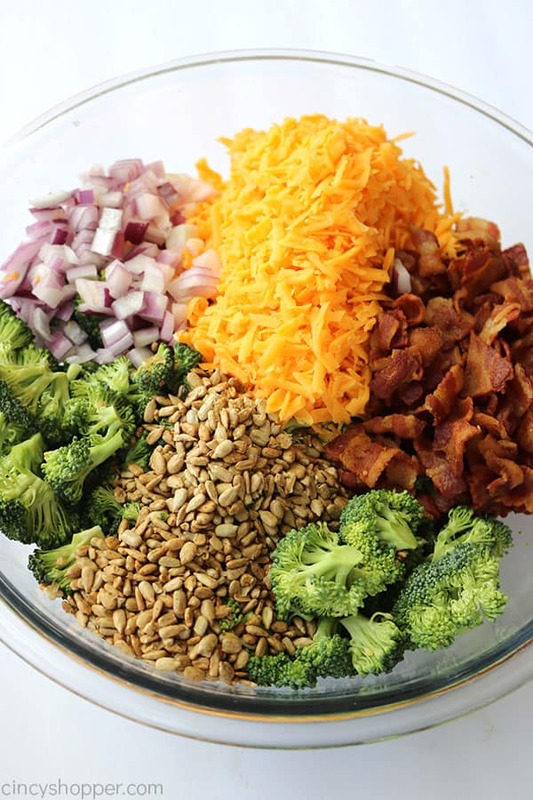 Sure, raw broccoli can be such a boring vegetable when it is served plain but, this salad adds in some crispy bacon, shredded cheese, onion, and a creamy homemade dressing. I find it quick and easy just like Creamy Fruit Salad. Both are great for a side dish. 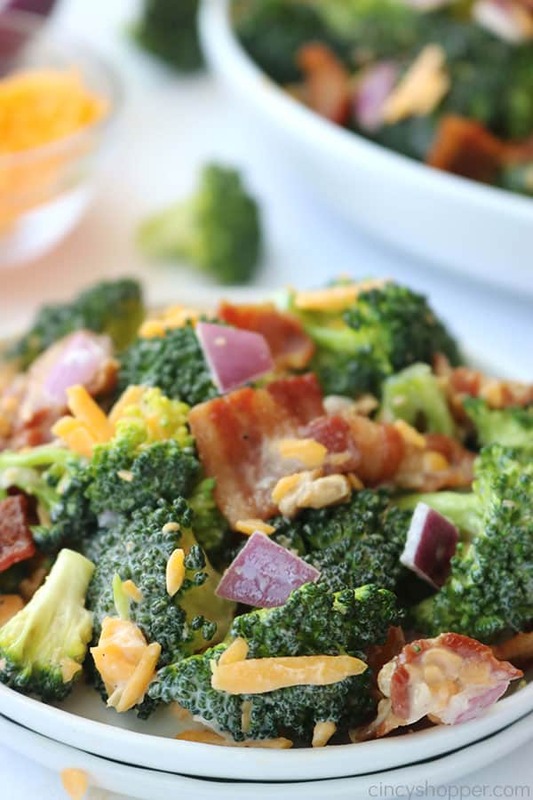 Broccoli Salad with Bacon is one of my favorite salads to make. The combinations of crunchy, sweet and cream are amazing. I shared this recipe years ago. I figured it was time to update this post with some fresh pictures and tips for making it perfect. Broccoli is the real star of this salad. I usually purchase around a pound. If I need to make the salad in a hurry, I buy a bag of broccoli florets. 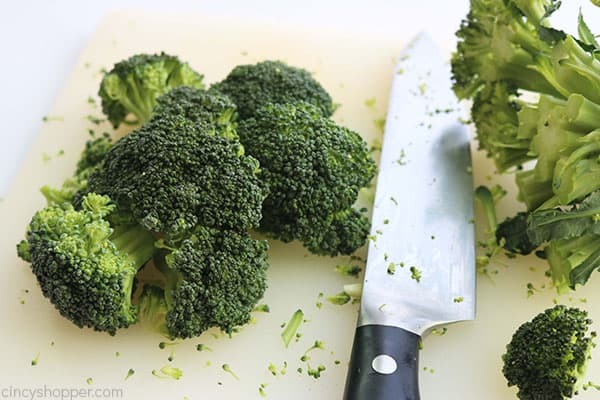 Precut broccoli makes the dish a bit quicker to make. When pressed for time, I will purchase store bought pre-cooked thick cut bacon. I can microwave the bacon to make it crispy, chop it and no real time is needed. This method allows for an easy broccoli salad. 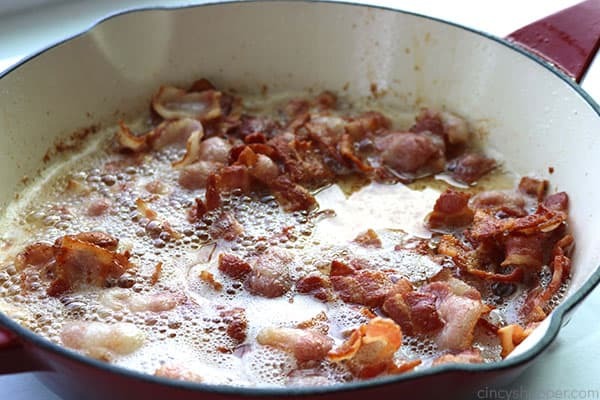 Some store-bought bacon does not crisp as well as frying the bacon myself. So, if I have time, I cut my raw thick cut bacon and fry it up. Just a few more minutes are needed if you should choose this step. Crispy bacon is the best! 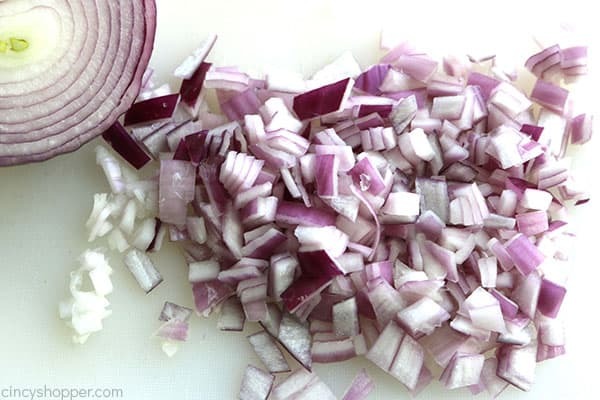 I add in about a half of a large red onion, diced. 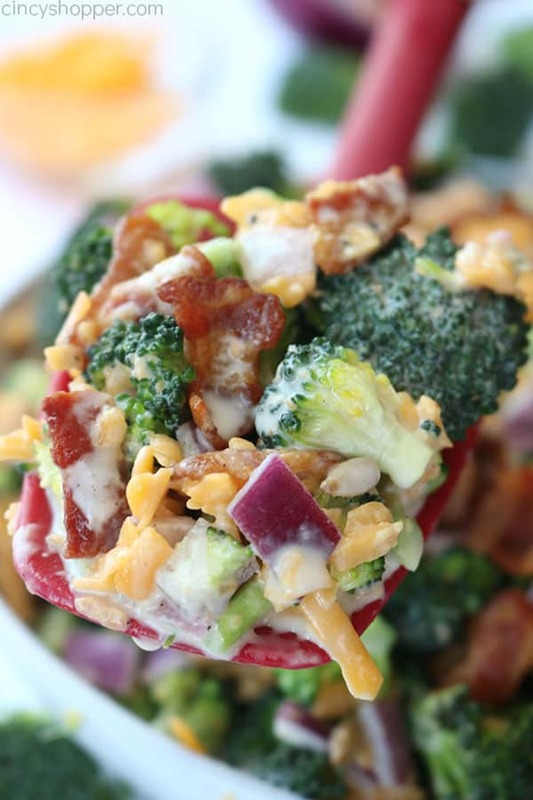 I find that red onion gives the broccoli salad the added color, flavor and crunchiness. If you want to keep the salad kid friendly, you could either dice your onion very small or omit it altogether. 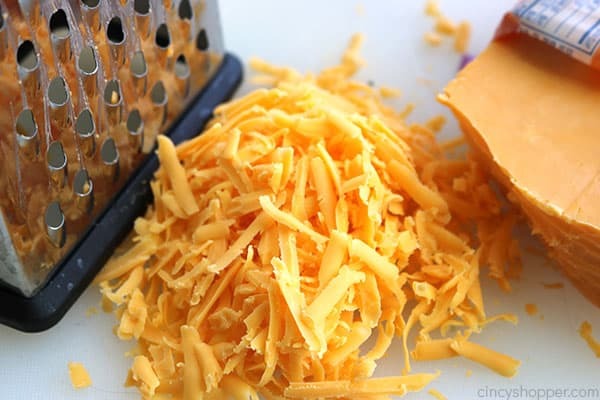 For my cheese, I grate fresh cheddar or sharp cheddar with my box grater. Freshly grated cheese is always best. 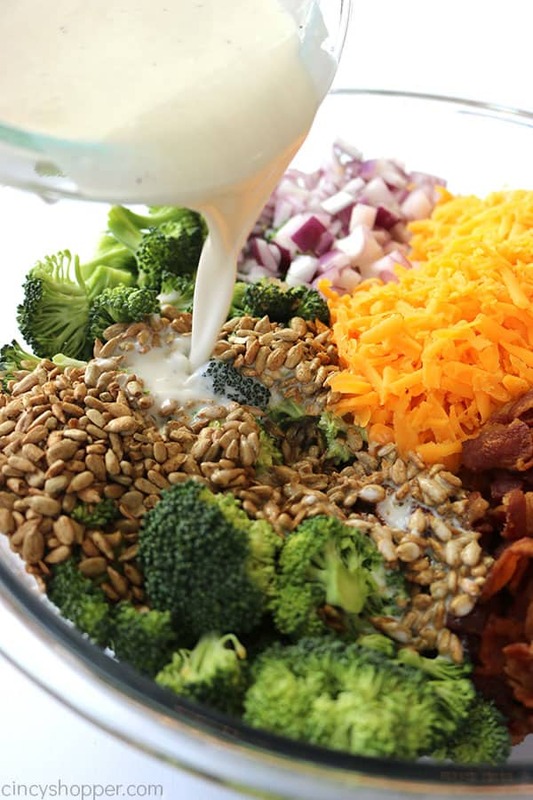 If you need to make your Broccoli Salad quick and easy, you can use store-bought pre-shredded cheese. I suggest using a thicker shred, not the finely shredded cheese. 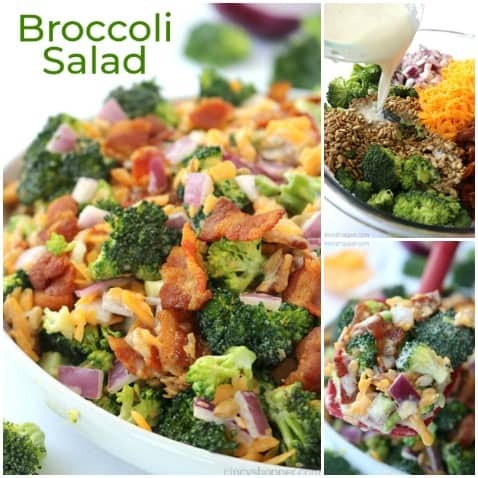 I like to add in additional mix-ins to our version of broccoli salad. The added flavor from sunflower seeds, dried cranberries (Craisins) or even diced grapes kick the dish up a notch. The additions are not necessary, but I think they add a bit of crunch and flavor. 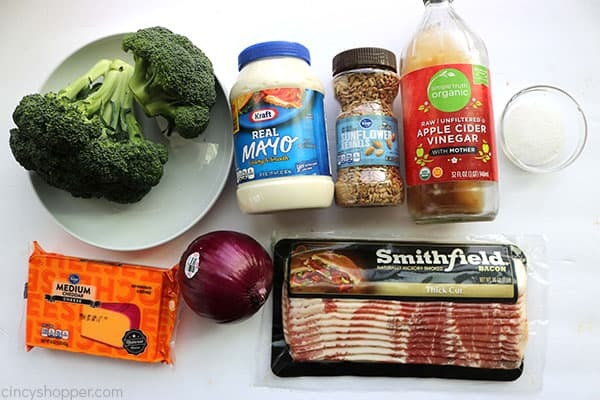 Now, for the creamy dressing. You will most likely already have the ingredients on hand. 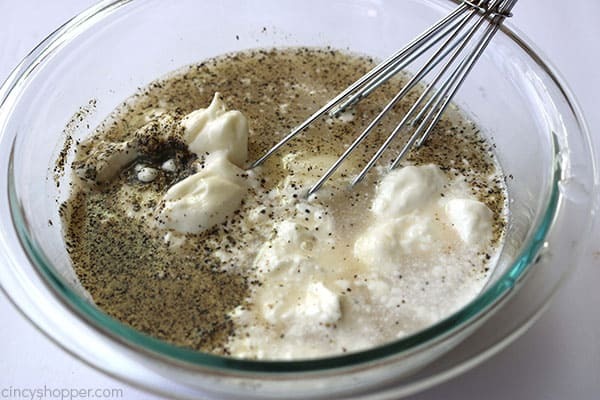 I whisk together mayo, hot water, sugar for sweetness, salt, pepper, and apple cider vinegar. The amount of dressing is enough to make the salad wet but not overly wet. I think this results in the best broccoli salad. 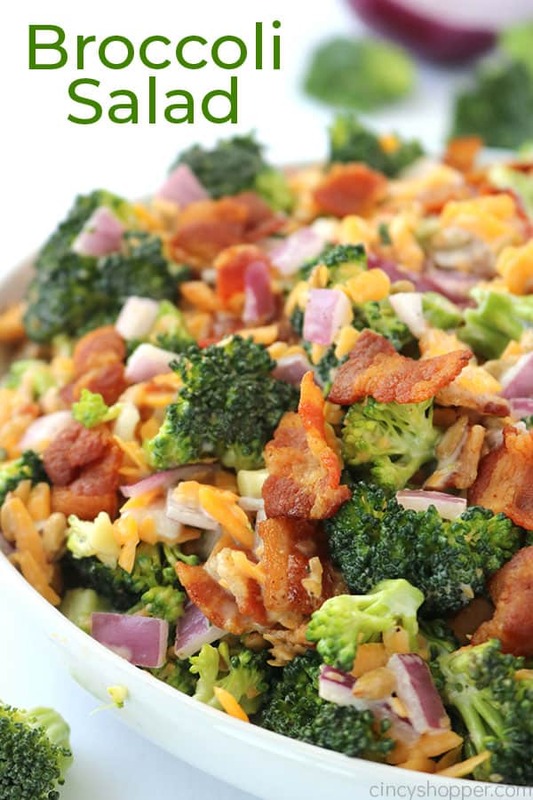 Place broccoli, onion, bacon and sunflower kernels in a large bowl. In a small bowl, combine sugar, mayo, vinegar, hot water, salt, and pepper. Whisk until blended. Pour this over the broccoli and stir to combine. Chill for a least one hour before serving. I like to refrigerate my broccoli salad for about one hour before serving. Chilling for a bit will allow for the dressing to soak into the broccoli. I have found the mixture will stay fresh for a day or two when placed in the refrigerator. In a small bowl, combine sugar, mayo, vinegar, hot water, salt and pepper. Whisk until blended. I LOVE your recipes!!! — but could you PLEASE include number of servings for each recipe?? Oh so sorry about that Barb! I have been including the serving count in my new recipes. This one, hubby forgot to add it in because it was a recipe that I updated. This specific recipe will serve around 8 people. I would think 10 if smaller servings. So sorry about that, I have updated the recipe. Thanks so very much! 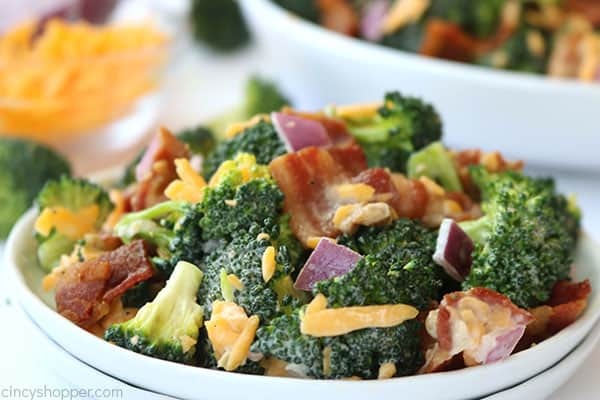 I never would have thought about adding bacon to a broccoli salad but when I tried your recipe it was a huge hit with my family! This is going on our regular rotation this summer for sure. We love all sorts of salads as either side dishes with hamburgers and hot dogs or just a bowl full for lunch! Thanks for the fantastic recipe Jen!